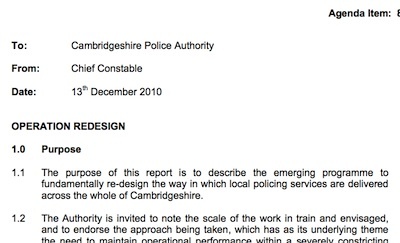 The Chief Constable’s December 2010 Report to Cambridgeshire Police Authority Introducing Operation Redesign. Two representatives of Cambridgeshire Police attended Cambridgeshire County Council’s Safer and Stronger Communities Overview and Scrutiny Committee on Wednesday the 14th of December 2011 to make a presentation and take questions on Operation Redesign. Operation Redesign is Chief Constable Simon Parr’s approach to dealing with cuts to the police budget. The principle is that rather than cutting parts of the force’s activities he is redesigning it. One of my previous articles on Operation Redesign lists its seven principle work areas and gives some background. Mr Parr did not attend the scrutiny committee himself, but sent Inspector Human and Mrs Sarah Dennett, a member of police staff, both of whom are members of the project team responsible for implementing “Operation Redesign”. I noted that one area where police chiefs were accepting the Operation Redesign cuts had been too deep was in the force control room, and police service centre; this had led to thousands of non-emergency calls every month going unanswered. I asked if the representatives of the police present were able to give the committee any indication of how bad things were and how long people were being left hanging on the phone waiting for it to be picked up. With some refreshing, but disconcerting honesty, from the police; the committee was told that the police hadn’t got the data and didn’t know how bad things were. Chairman Cllr Tierney interjected and asked for the data to be obtained and provided to the committee. I followed up asking why the police were not solving this problem straight away, given the negative impression of the force that it was giving so many residents of the force area who were finding themselves unable to get through to the police. I asked it wasn’t being given higher priority and why staff were not being moved from other parts of the organisation to man the phones. The police representatives said that they did not want to make a “knee jerk reaction” (the problem has been going on since the summer). They told the committee there were no plans to address the problem in the short term, and were unable to give any estimate of when the promised technological solutions to enable the call volume to be handled with the reduced number of staff would come online. I asked that if, given control room staff were stressed to the point of not being able to answer the phones, if any other important, but less obvious, things were not being attended to in the control room. I asked, as an example, if the Automatic Number Plate Recognition (ANPR) alerts console was being monitored and responded to appropriately. Inspector Human responded to say that the force control room staff were not stressed. (He was playing with words, clearly if the phones are not being answered the system, a key part of which is the staff, is under stress). He said ANPR alerts were being monitored as appropriate and that much of that work was done outside the control room by a dedicated ANPR team. Cllr Hoy asked if Neighbourhood Policing Teams had gone. The police representatives said: “No”. They went to to explain that under the changes all officers in a district will be classed as Neighbourhood Officers. I think this is a really good thing; I don’t think the separation of response police has worked well, I agree all police officers should be local officers somewhere, as well as having wider duties when called upon. I think the police have become divided into two disconnected parts which have not been working well together. When I first learnt of the degree of separation between neighbourhood and response officers I was surprised and am happy to see a more co-hesive force being created again. It was noted by the police representatives that PCSOs were still, and would continue, in existence. Cllr Hoy noted that the area covered by her local inspector had increased. She said that while there used to be an Inspector for Wisbech there was soon to be an Inspector for Fenland. Cllr Hoy said she thought having a local named sergeant was and received an assurance that this would continue. Cllr West asked why neighbourhood watch had not been used as the basis for the force’s redesign. Unprompted, he said that neighbourhood watch was “not vigilantes”. UKIP Cllr Reeve spoke in favour of the neighbourhood policing teams. Labour Councillor Tariq Sadiq expressed concern about how restorative justice disposal performance was being described in terms of reduction in use of custody and police officer time saved. He said that a more important evaluation from his point of view was re-offending rates. At this point Cllr Brooks-Gordon (Lib Dem) sought to speak to “answer that point”. Chair, Cllr Tierney however invited the police representatives, to whom the question had been directed, to respond and provide the answer. (Cllr Brooks-Gordon often appears to try and play the role of an expert when she is present in meetings as an elected representative). Inspector Human explained there were no formal targets placed on restorative justice and assured Cllr Sadiq that savings in officer time and custody costs were just consequential bonuses of the restorative justice approach being taken. Inspector Human said what was driving restorative justice was the desire by the police to “do the right thing”. Inspector Human said that while there had been no formal analysis of reoffending rates following restorative justice disposals yet, he could report that he had a very simple spreadsheet which listed each offender who had been dealt with by restorative justice and if they had reoffended or not. He reported the current reoffending rate was running at 8%. He compared this with a reoffending rate of 15% for those who had been given a reprimand or final warning by the force in the run-up to the introduction of restorative justice, which he said was the best comparator as it involved the same types of offences as were now being dealt with by restorative justice disposals. Inspector Human told the committee that the force estimated 8,000 hours of police time had been saved by using restorative justice disposals. He explained that this was based on each case taking one, rather than nine, hours to deal with and around a thousand cases of restorative justice having taken place since its introduction earlier in the year. He usefully explained the force’s workings behind the figure so we could assess its credibility. Inspector Human stopped Cllr Brooks-Gordon to explain that she was talking about something which was something which was quite different from what was being done in Cambridgeshire. Gosh. That’s not like anything I’ve read about restorative justice in an academic paper. It doesn’t sound like the restorative justice I’ve read about being effective elsewhere. The point that what Cambridgeshire Police are doing with restorative justice disposals is very different from the type of restorative justice which has been studied via UK government funded research was one I made in my 7th September 2011 article on the subject and in my letter to Cambridge’s executive councillor for policing Cllr Bick as well as in the statement I made in the public speaking slot of the September Police Authority Scrutiny Committee meeting. Hopefully now Cllr Brooks-Gordon has heard this from Inspector Human, the force lead on the subject, she will retract her previous comments to the West-Central area committee, and apologise for her preventing me from describing the process in use by Cambridgeshire police as it didn’t fit with her previous experience. You don’t have to convince me-impact on recidivism in well controlled trials does that. She appears to have rapidly dropped back into using evidence based on very different types of restorative practices to support Cambridgeshire police’s instant reparation policy. Cllr Renyolds, a member of the Police Authority, asked the police representatives to tell the committee how many police officers there were in the force, and to confirm to the committee the number was being maintained. The police said the officer number was 1011 and would be maintained. Cllr Renyolds then asked the police to encourage people to report crime by email to the ecops email addresses. The police politely just didn’t respond to this (it’s a bad idea as it makes it less likely a crime will be properly recorded). Cllr Pellew asked about costs saved by sharing back office services. A question on rural crime prompted one of the more interesting revelations. The force representatives stated that a new team of police had been created; which was known as “The Chief’s Reserve”, or more formally the “Tactical Team”. This force it was reported could be deployed where it was needed to “provide the interventions required”. Is the Chief creating his own personal force within a force? Is this something akin to the Metropolitan Police’s notorious “Territorial Support Group” which has been created in Cambridgeshire? Will this reserve be even more of a blunt instrument than “response police” were? There was no time for any of these questions as this was the last element of the discussion on Operation Redesign. Chair, Cllr Tierney, invited the police to come back to the committee for a further update on Operation Redesign in six months time. The force representatives agreed to return. This entry was tagged Cambridgeshire, Police on December 17, 2011 by Richard Taylor.